Hosting a party? Indulge your inner artist with a private party! Our private parties are the best new and unique party idea for all types of occasions and are a wonderful way to get your group together to paint, sip, nosh and have a great time! From bachelorette parties to birthday parties to family reunions, everyone is guaranteed to have a blast while creating their own piece of artwork. Paint and sip in an energetic and interactive group setting and end the evening with not just a beautiful personal creation, but a smile and great memories as well! You pick the venue — your home or business or one of our Preferred Partners! 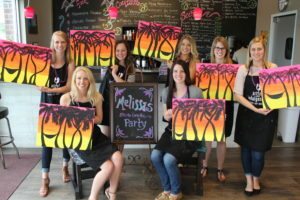 If you’re looking for a unique way to honor the bride-to-be AND create a fun and exciting night out for the bridal party – paint, sip, nosh is the way to go! We will help you plan your special night, with signature cocktails and appetizers to enhance the creative experience, and make sure it is a night everyone will enjoy and remember. We’re talking about FUN art – not FINE art, and no experience is necessary! Children and adults of all ages have fun painting on canvas! Our skilled local artist are also experienced in instructing and encouraging children to learn and enjoy the creative process. Invite guests of all skill levels to join the entertaining celebration, have fun with their friends and leave with their own little masterpiece they can be proud to share. The size of canvas and subject are chosen appropriately for the age group. 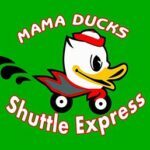 Whatever special occasion you are recognizing, we would love to help you plan a personalized event that takes your celebration to a whole new level of special, fun, and unique. We’d love to chat with you about your special idea! Call or email us to get started! We accept Mastercard, Visa, and Discover paid online. Then just show up because we’ve got you covered! We provide everything you will need: the instructor, canvas, paint, brushes, easel, and art apron.